About a month ago, I finally redid our bedroom. 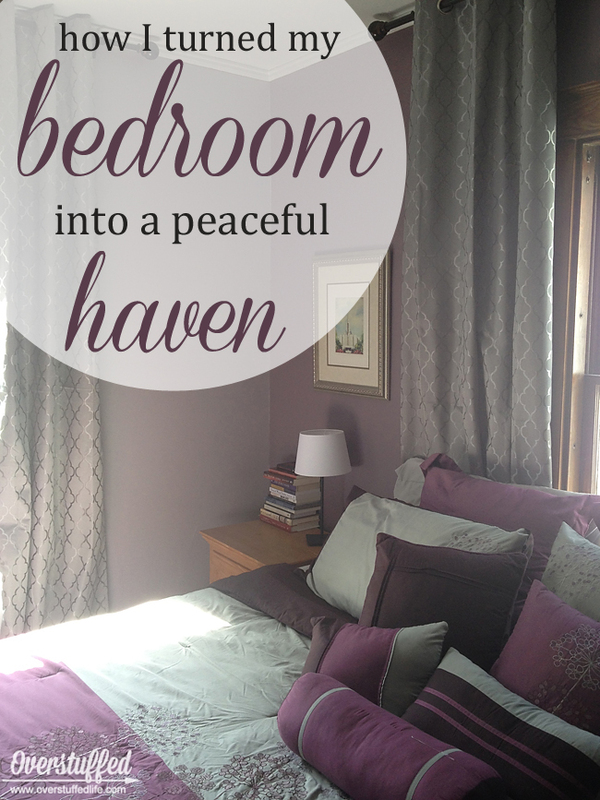 I honestly had no idea how much of a non-peaceful haven it was until I finished up with the bedroom makeover. The end result is just so much better that I wonder what made me wait so long to finish it! Before I show you the metamorphosis, I must confess that I am terrible about remembering to take before photos when I do these projects. I am not really a DIY or even a home decor blogger, so I just dive right into a project and only remember to grab photos halfway through. Someday I'll learn! I dug through some recent photos and came up with this one from a few months ago when I was recovering from shoulder surgery and The Maestro had pneumonia. What a fun time that was! 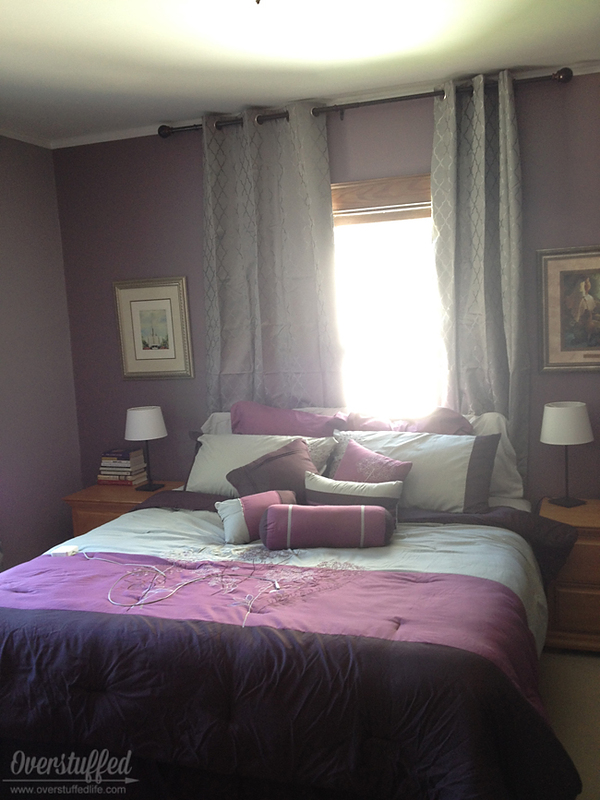 But, you can at least get an idea of the old wall color, bedding, sheer curtains, and a small glimpse of the wall decor. When we moved into this house the (tiny) master bedroom was really the least offensive room in the house as far as paint color and carpeting. I mean, compared to Bria and Chloe's bedroom and Sophia's bedroom, it was downright gorgeous. And that is why it took me almost six years to do anything about it. The Maestro went to conduct an orchestra in China in May. 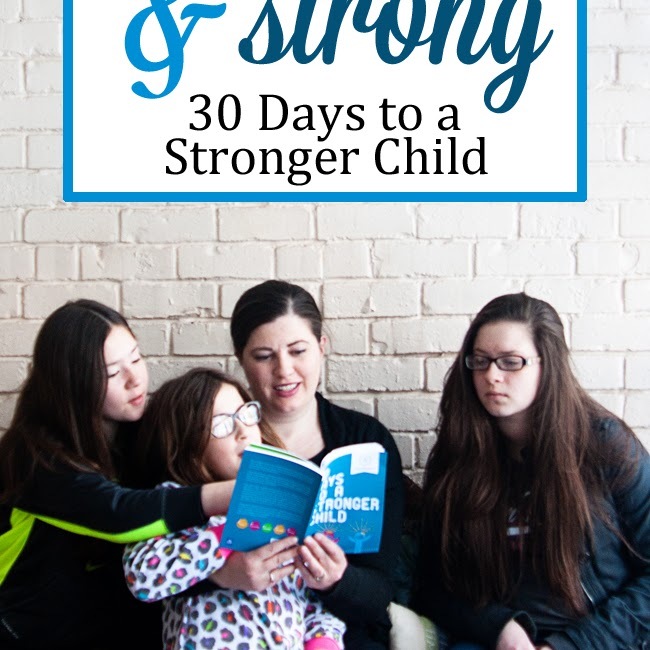 He was gone for nearly two weeks, I was finished working for the semester, and the girls were still in school. 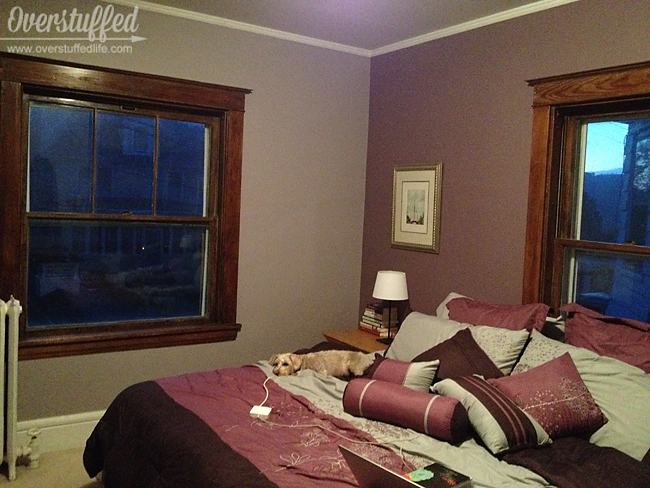 It was a perfect time to redo the bedroom to surprise my husband, so I got to work! Before I go into all the ways to make your bedroom a room you want to spend lots of time in, here is a list of the materials I used. The first order of business was to find new bedding. I knew I wanted calming, peaceful colors for the bedroom and The Maestro is a Type 2 in the Dressing Your Truth system. This means that grey is one of his signature colors. I've decorated the house without asking his opinion plenty of times, so I thought this time I would choose the colors that I know work with his Type 2 Energy. They are super calming colors, so that was perfect for a bedroom anyway. 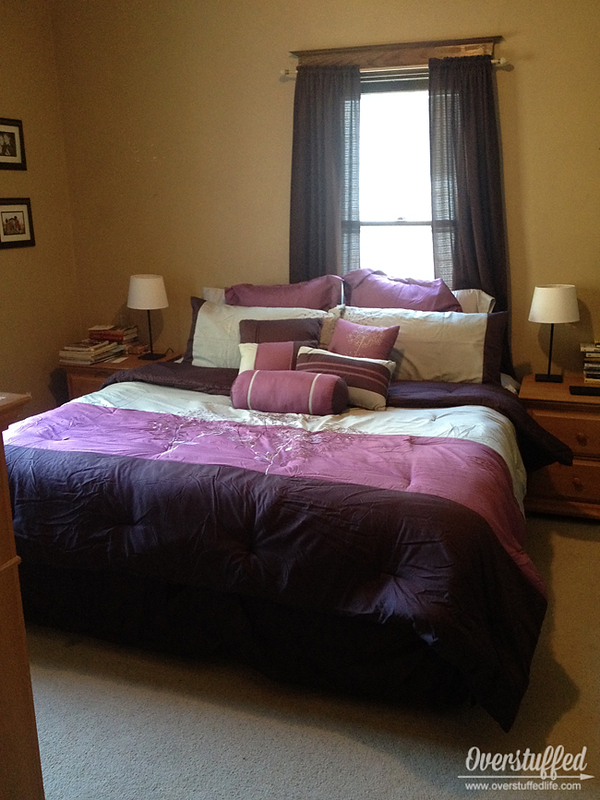 I got rid of the old green and brown bed set, and already that made a huge difference in the energy of my bedroom! Here is the new set with the old paint and curtains. I had also put up some new lamps I got during our IKEA trip in May. Before we only had one lamp and it had seen better days! The next order of business was to choose paint colors. I ended up choosing Sherwin Williams Soulmate for the accent wall and Sherwin Williams Beguiling Mauve for the other three walls. They are a purply grey, or maybe a greyish purple, depending on the light. Plus I will admit to liking the name "Soulmate" for our bedroom paint color. Paint color all chosen—now it's time to paint! 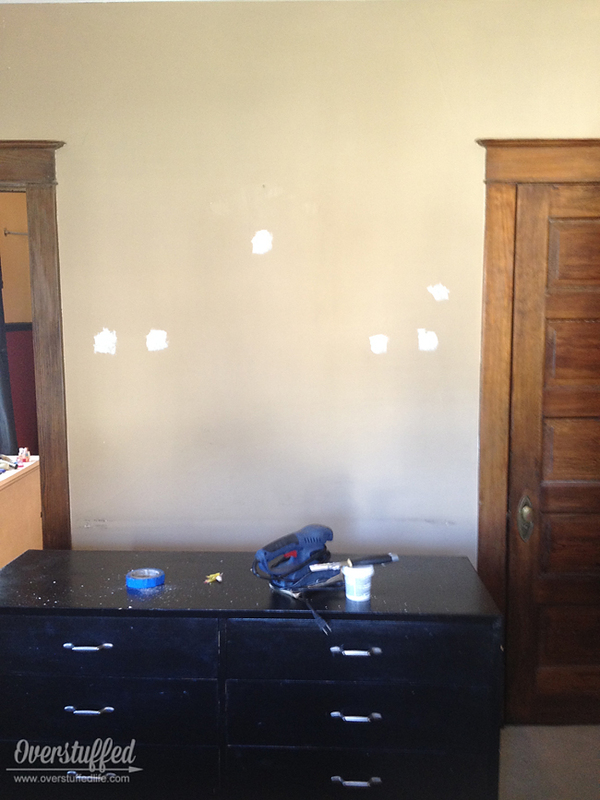 I spent a day removing things from the walls, cleaning them, patching holes, and moving furniture away from the walls. 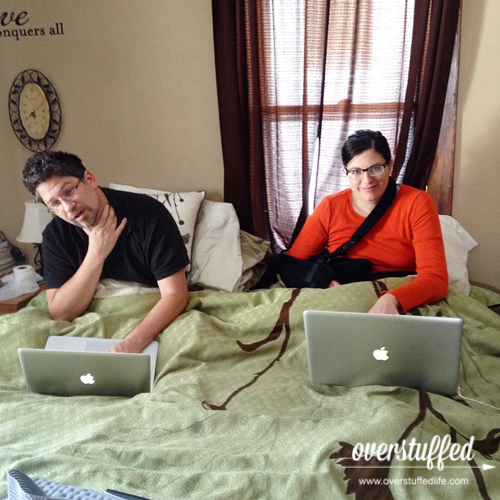 Now, remember that I had shoulder surgery fairly recently. 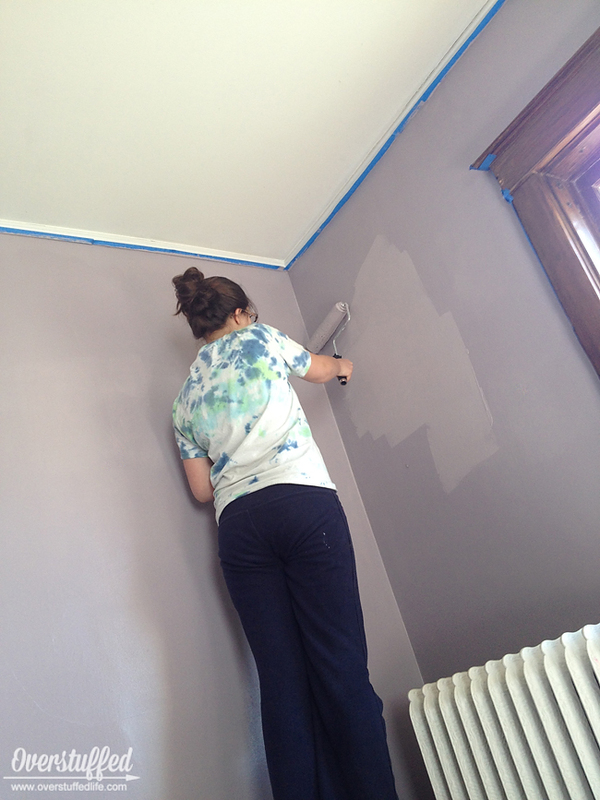 So I did all the taping, and then my 14-year-old daughter helped me paint. I did a lot of the low stuff, but she did 75% of the painting. My shoulder and I thank her profusely! We spent an entire Saturday painting together and had a great time doing it. I wasn't sure about the lighter color as it went on the wall—I thought it might be too feminine and lavender looking, but as it dried I found myself liking it more and more. Here are a few good photos to see how the accent wall and lighter walls came together. They are right next to each other on the paint card, so I was really happy to see that there was just the right amount of contrast to the walls. I really wish you could see it in person. It is so hard to get good photos in this bedroom! Either the sun is blasting through the windows or it's too dark to get clear pictures. But my phone did a pretty good job considering the awful conditions it had to deal with! 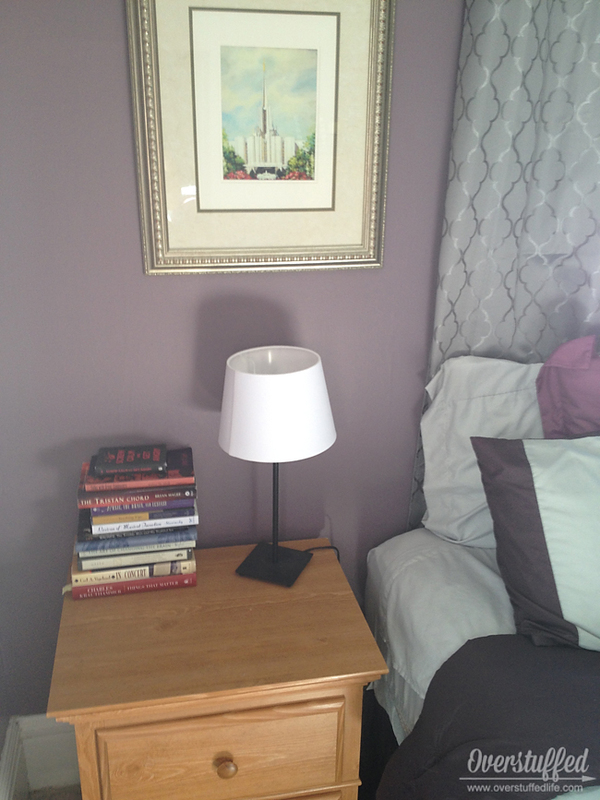 This last photo is the best I could get to show you the two nightstands together with the accent wall. The painting on the right is one that was hanging in our dining room. I wanted something of similar size and frame to be on the other side, so I headed over to the consignment store and looked. I found that frame with a really awful piece of commercialized art in it, but I knew it would be perfect. I brought it home, took it apart and replaced the ugly artwork with a painting that I had of the temple where The Maestro and I were married. Here's a photo of the walls that aren't contrasting--what we look at while lying in bed. I love the calming color! It took me a while to get the curtains up. I struggled to find just what I wanted, but I finally made a decision that I was happy with, and I found them on Amazon. 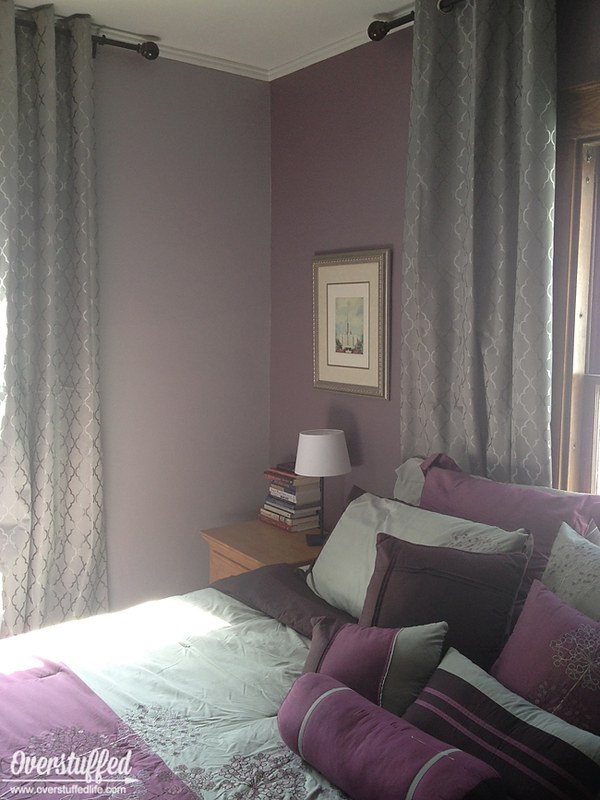 These grey jacquard black out curtains are perfect! Black out curtains are so essential to getting good rest in your bedroom. In the summers where I live it doesn't get dark until 11:00 pm and the sun is back up by 5:30 am! The winters aren't bright, but they are cold, so the thermal part of the black out curtains is essential then. 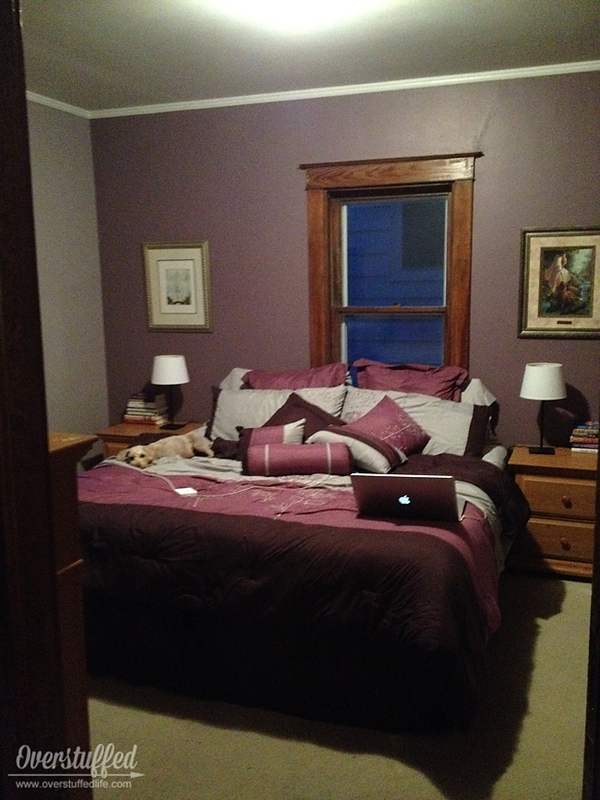 One of my least favorite parts of our small bedroom is that the king-sized bed cannot be centered against the window. That wall is the only option for a king-sized bed due to the radiator and doors around the rest of the room. I wanted to find curtains that could hide the off-centered window and give the illusion that it was a larger window than it actually is. To accomplish this, I hung the curtain rods all the way at the ceiling. Also, I have no earthly idea how I did that with my shoulder, but it was the most difficult thing I did in this room! Thank goodness for a power drill and a stubborn will, I guess! For that smaller window, I centered the curtain rod with the bed instead of the window, that way once the curtains were hung it looks like the window is bigger (and centered). It's hard to see how great the curtains actually look with all that sunshine, but I love how they disguise the centering problem. Nobody has to know! I just love how they pulled the whole look of the bedroom together! 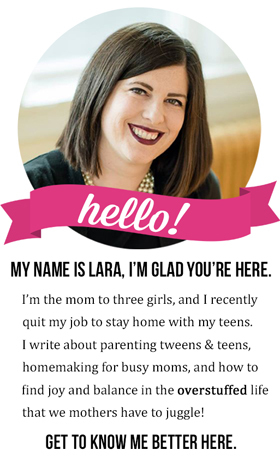 I know I'm always talking about how getting rid of clutter brings you more peace, but it DOES. And it's especially important in your bedroom. 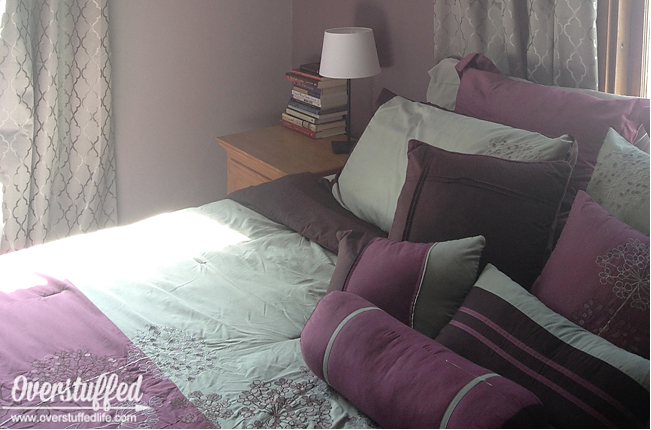 If you want a peaceful bedroom space, get rid of all the stuff that's cluttering it up! Our nightstands are really good at gathering random junk, so I've made it a point to clean them off daily and only keep our book piles on them. I love how clean that one simple thing makes the room look. 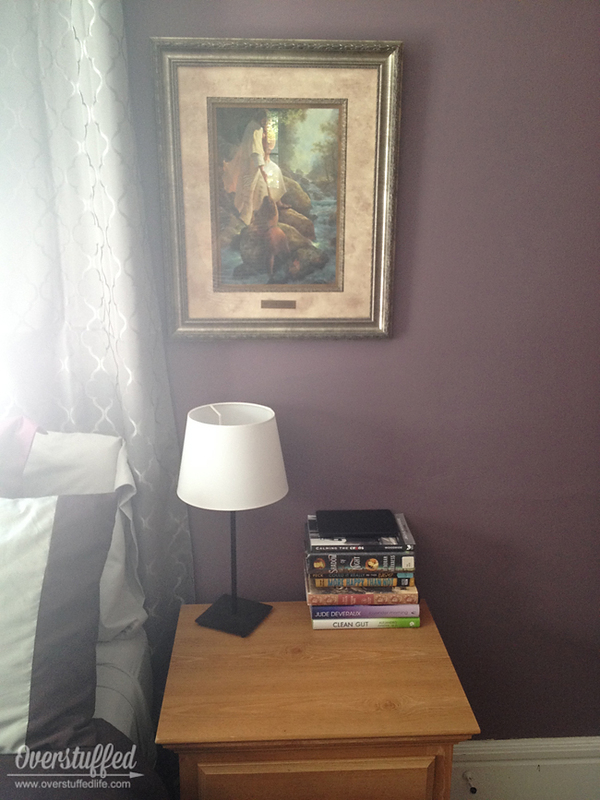 Here's my side of the bed, with my Kindle and various self-help books and fictional novels. And here's The Maestro's side of the bed with lots of books about music. Before I redid the room, I had a lot of photos of the kids in there. 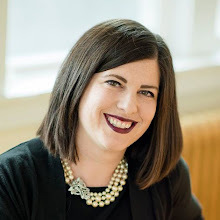 But I decided that I really wanted the room to be just about me and my husband. About us. I have plenty of photos of the kids all over the house, and I have very few of just The Maestro and me. 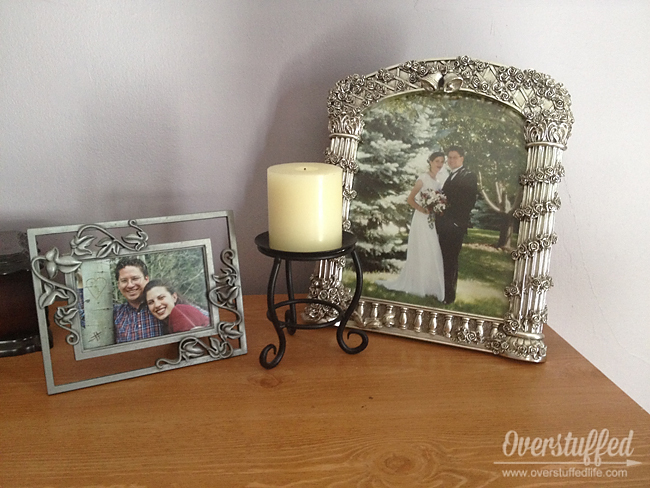 I had already used up my budget, so I just used our wedding and engagement photos that were already framed from 16 years ago. I am hoping to get a few more recent pictures of the two of us in there soon, though. The only other artwork currently in the room is the painting of the temple where we were married and the other painting of Christ above the nightstands. 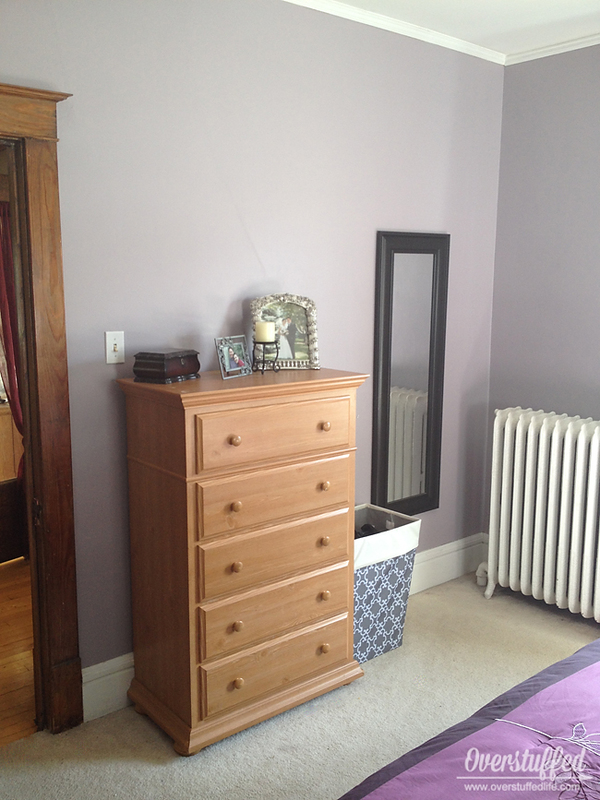 Oh, and I decluttered these other two dressers,. too--and I'm working hard to keep them that way. 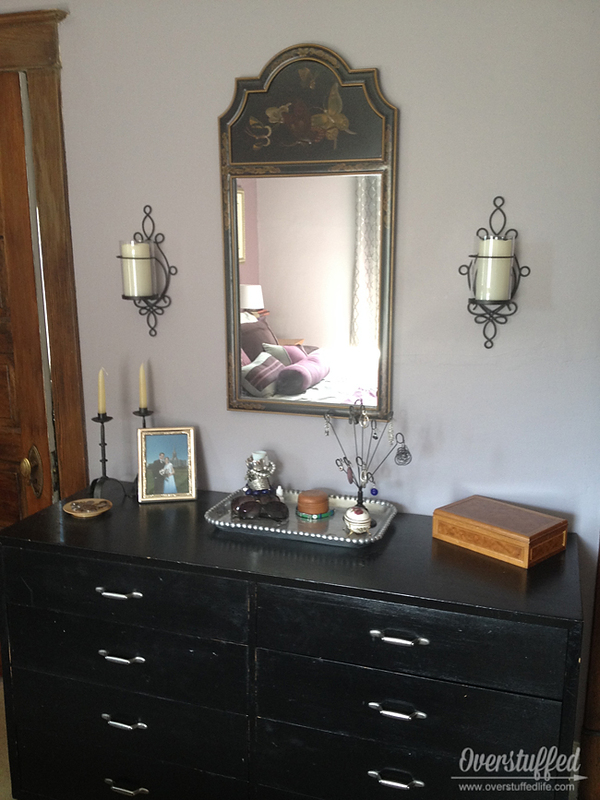 I also added a silver tray that I love but didn't have a place to my dresser. It makes a nice holding area for jewelry and make-up while I am getting ready (or when I'm too lazy to put it away immediately). Where those wall sconces are used to be some hooks that held all my jewelry. I'll talk about my new jewelry solution in a future post. The mirror was my grandmother's, and while it doesn't totally match the style of the room, I love it, and it's the only one I had. Besides, it's the most honest mirror in my house—I couldn't possibly get rid of it! In other words, make the bed daily. I am not always perfect at this, but it sure does go a long way to making my bedroom a haven. And it only takes me 3 minutes. So that's it! Let's all just give it one more look—can't you just feel all the peaceful feelings exuding from that room? I am so happy I finally got it done! What a beautiful transformation! I bet you smile every time you go in there. 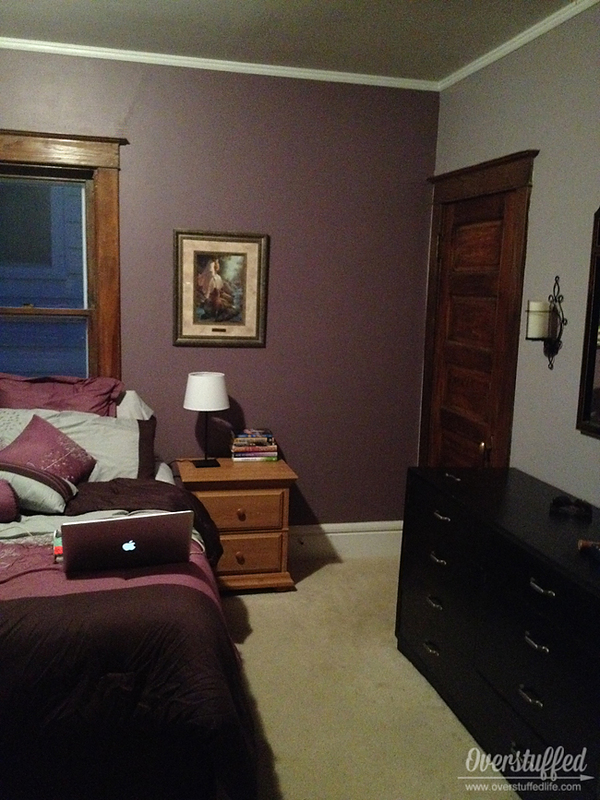 :) I love seeing REAL room makeovers. I love the colors! My room is getting a makeover as soon as I get a new mattress! So beautiful! Love all the colors. I so need to redo my bedroom. I think it's a super makeover and the colors are gorgeous! Enjoy your sanctuary! Very nice. When we moved in here last July I decided to do our bedroom first. It is so calm. I don't allow any clothes or shoes to clutter the floor and I make the bed immediately upon getting up every morning. I love what you have done - the colors are awesome. We are in need of small makeover ourselves - mostly a good decluttering and some paint on the walls - hopefully it is on the fall to do list. Too many things in front of this room. Your colours are spectacular. I too am thinking of updating our master bedroom. We have had the same colour for 17 years mauve and I think it is time for a change. I am not that talented in Colours and making a room look nice, but your post is inspirational.